Is there an admission fee to enter Family Fun Town? Except during special events (which we post in advance), there is no admission fee. You pay as you go for what you want to play. Do you charge for parents to watch their kids? No! We are happy you are here supervising your children. Cash, Visa, Mastercard and AmEx. Also, if you have “cash value” on your Family Fun Town “Fun Card”, you may use that to pay for attractions and “The Pit Stop”. Only from organizations that have reserved a visit with us. What does it cost to park at Family Fun Town? Yes, we have great packages for 10 or more booked in advance. Yes! If you have reserved a party with us, we provide the paper products. If you haven’t, you must bring in your own paper products, but please remember, we do not permit any other outside food or beverages. Do you have cakes available for purchase? Sorry, we do not permit outside food, drinks or candy. Does “The Pit Stop” have any fast food? “The Pit Stop” has a Fast Counter where quick serve items may be purchased. These items include pizza slices, hot dogs, pretzels, nachos and soft drinks. Does “The Pit Stop” take reservations for lunch or dinner? Yes we do. You may reserve a booth (up to 3 at a time, if available). How many guests can The Pit Stop seat? We have 12 booths that can seat up to 4 people and 48 people total can sit inside. What do you charge to cut my cake? We do not charge a cutting fee. Can I have a private party at Family Fun Town? Yes. 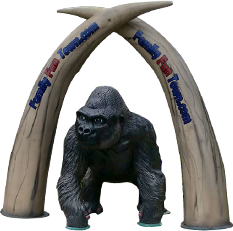 For more information, please contact us at (386) 775-3181 or info@familyfuntown.com. How far in advance should I make a party reservation? As a rule of thumb, parties should be reserved at least 2 weeks in advance. However, if we have space available, we’ll take your reservation at any time. NOTE: For private events, a much longer lead time is needed. Yes. We sell Family Fun Town “Fun Cards” in any denomination. Can I use my laptop and go online at Family Fun Town? Yes, we have WiFi! Please ask any of our staff, so they can get you the password. Does Family Fun Town do cash sponsorship? Yes! Any non-profit is eligible to host a fundraiser with us. We donate 10-15% of the proceeds back to your organization. Please call us today to book your event. Will you donate something to an auction for my child’s school? Yes! Family Fun Town is happy to donate services to non-profits. Please contact us and we will try to accomodate your requests. As the parent, if I say it is ok for my child to drive even though they are too short, will you let them? Sorry, no. We are mandated by the manufacturer and the state on our rides and attractions. What kind and how many arcade games do you have? We rotate games in our arcade frequently, so the number of games fluctuates. But, on average we have 25 Card Redemption Games, 10 Video Games and another 10-12 Specialty Games. What batting cages do you have? We have Softball and Baseball and varying pitches from slow to fast. How fast do your Go Karts go? Our Go Karts go approximately 18mph. What kind of shoe is required on Family Fun Town’s attractions? The best shoe is a closed-toe athletic style shoe. However, we do permit other footwear. If I purchase an unlimited play package can I share it with someone else? If I purchase an unlimited play package and don’t play for the full time, can I use the remaining time at a later date? The time starts ticking at the first attraction played, so the package will time out after the number of hours purchased. Can we play outside at night? Yes! Family Fun Town’s outdoor attractions are fully illuminated. What is a Family Fun Town Fun Card? It functions just like a debit card but for Family Fun Town attractions only. Fun Cards replace tickets and tokens. You purchase a fun card to play at Family Fun Town.